We all know that Chrome is a great browser. This is exactly why many a times we expect more out of it. If the browser itself does not fulfill the need, we try to find extensions. It’s very easy to overload your Chrome with all these useful extensions. But eventually this takes a toll on your computer memory and things slow down. This is why we need to manage these extensions carefully. The need for the extension manager is especially critical on Chromebooks, as one does not have loads of memory to play with. Adding another extension to manage extensions may sound counter productive, but it is not. Extensions Manager (aka Switcher) and SimpleExtManager are two little gems which really make this easy. Extensions Manager is my favorite of the two simply because I find it more usable (more on that later). But SimpleExtManager is definitely not far behind and you should definitely try both and see which one suits you the best. Both these extensions offer basic essential capabilities very well. Both add an icon to Chrome toolbar which, when clicked, will display a list of all extensions, applications and themes you are using. Extensions Manager nicely categorizes these by different views or tabs like All, Extensions, Applications, Themes, Enabled, Disabled and Recent. SimpleExtManager shows a single vertical list with categories like Extensions, Applications and Themes as separators. You can enable, disable and uninstall individual extensions right from here just by one click. You can also go to the options page of a given extension if there is one. Both Extensions Manager and SimpleExtManager also provide search/filter capabilities that is useful in case you deal with large number of extensions like me. Just type first few characters and it will start filtering the list immediately. UNDO capability is provided only by Extensions Manager and it could be very useful if you unintentionally or accidentally click on something. Another important feature which both these offer and where Extensions Manager scores for me is grouping. Simply start dragging individual extensions from the list and drop it on the flashing New Group tab on the top / title bar. Once your drop is complete, just double click on the tab to rename it. Groupings not only keep your extensions organized, but also allow you to turn ON or turn OFF entire group of extensions together. I organize my extension broadly as follows. I have one’s which I use all the time, so I call those Alltime. Another group is called Web Design which contains handy utilities like Eye Dropper, WhatFont, Resolution Test etc. that I use only when I’m working on my site. Similarly, I have groups called Blogging, Social and Utilities. I turn ON only the individual groups when I’m doing a particular task. In order to toggle a group ON or OFF, just select the group you want to work with and select Switch ON or Switch Off button. Additionally, it also shows a thin red line below group heading which is called Group Statistics Meter indicating the amount of active extensions in that group. It also shows the stats in a tool-tip for completeness. If you want to remove the extension from the group or remove entire group, just drag and drop it outside the window. This will not remove the extension or all the extension in a group from the Chrome as expected. This is simple group manipulation. For SimpleExtManager, you need to go to options pages in order to create, edit or delete groups. Developer behind the Extensions Manager is said to be working on feature which will allow automatic syncing of configurations across devices. Currently it offers a way to export and import configurations to keep your Chrome on different devices in sync. SimpleExtManager does not offer any way to do this at this point of time. SimpleExtManager seems to more actively developed (last updated in Dec 2013) as compared to Extensions Manager which was last updated 8 months back. According to this discussion in Oct 2013, as per the developer the maintenance will be restored soon. The reason I prefer Extensions Manager over SimpleExtManager is due to the fact that it saves me number of clicks and scrolling. The UI/UX is much more powerful. SimpleExtManager is on the other hand may appeal to those who are looking for cleaner and simpler layout and don’t mind extra clicks and scrolling to get to the same functionality. 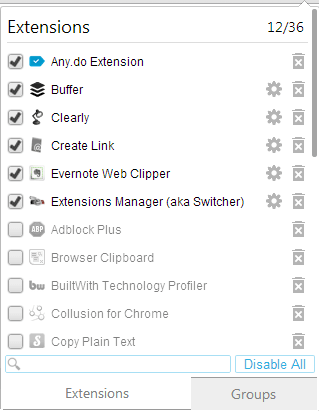 Extensity and One-Click Extensions Manager are the other options you may want to try out. If you’re already using any of these or something else or planning to use soon, do drop me a line on which one you prefer and why.